All of our sausages are made in-house using only the freshest, all-natural ingredients. Inside our natural casings you'll find meat, vegetables, and spices - no fillers! Our sausages are preservative-free and contain no MSG or nitrates. They're excellent fresh, but can also be frozen and stored for several months. We can slice them fresh or send you home with a mini-loaf. 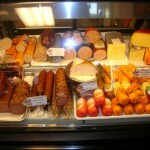 These traditional deli meats make amazing sandwiches or are great just to nibble as-is! Patés, side dishes, and all the goodies necessary for a European feast! Cased, cured, and smoked in-house, these items are all fully cooked and ready to eat, hot or cold! Fresh from our ovens, these breads and pastries are made with Old World recipes for a unique flavor you can't get in American grocery stores! We carry a wide selection of refrigerated and dry packaged and canned goods imported directly from Europe. Cake mixes, mustards, jams and jellies, pickled delights, noodles, candy, and even magazines! 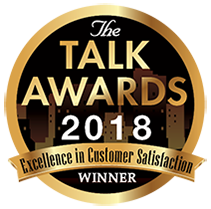 Our selection is always changing, so give us a call if you're looking for a specific item and we can tell you if it's in stock - if not, we'll do our best to get it in for you! On May 11, 2016 Emil’s was featured on WSVN’s Deco Drive! Watch our spotlight video below. Real Emil’s European Sausage Kitchen just took home 6 awards in the American Association of Meat Processors Quality Competition for Sausage and Ham! 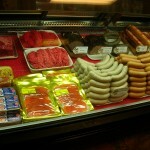 Check out our placement here – proof that you get only the best, authentic sausages and meats from Emil’s! 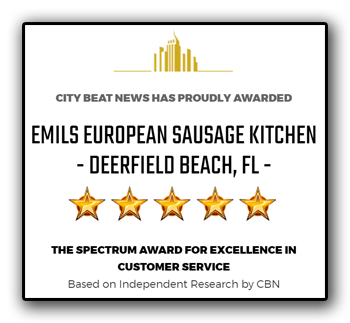 For over 60 years The REAL Emil’s European Sausage Kitchen has been bringing Old World flavors to South Florida. From the original store in Pompano Beach which opened in 1954 to the new location in Deerfield Beach which is operated today by the 6th owners, Walter and Jutta Voos, Emil’s mission continues to be to provide top-quality meats and European specialties. 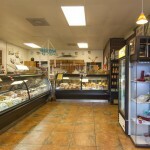 All of our deli products are produced, cured, and smoked in-house with NO preservatives, MSG, flour, sugar, or nitrates. It’s all fresh, all natural, all authentic ingredients and recipes passed down from generation to generation. Come browse our selection of European goods including cake mixes, jams and jellies, canned goods, magazines, cookies, and candy. Contact us for special orders – we can create a feast for any occasion! Call or e-mail your order in advance to have it ready for pickup when you arrive. Order a custom party platter for your next get together!